RackNation S.A. Review 2019: Is RackNation S.A. a Good Hosting? Website Planet > Web Hosting > RackNation S.A. Reviews and expert opinion RackNation S.A.
Costa Rican company RackNation offers shared hosting, colocation services, cloud computing, and dedicated server solutions. RackNation is a large web hosting provider based in Costa Rica. Established in 2006, the company that started out as a software-as-a-service (SaaS) provider decided to change direction to become a web hosting solutions provider in 2012. Since its 2012 relaunch, RackNation has increased its market share substantially by delivering hosting services to individuals and businesses in Costa Rica and other countries including the United States and Canada. Today, RackNation is ranked among the top three largest web hosting companies in Costa Rica by market share. Their website is available in English and Spanish. RackNation’s cloud and dedicated servers are housed in a big Costa Rican data center that is guarded 24/7 by CCTV cameras and an armed security team. Further security measures include secure Mul-T-Lock main entrance doors and access controls that use magnetic cards on all server areas. For their dedicated server clients, RackNation guarantees customers access to their redundant cooling systems, redundant power supply units, and premium bandwidth. They use Noction, an intelligent routing platform that uses live and accurate network analysis to avoid network congestion by ensuring that traffic to your website uses the least congested path. All RackNation’s routing and switching uses multiple 10 Gbps connections between endpoints and is composed of fiber optic uplinks. The physical fiber paths achieve a higher resiliency by taking different routes through the public infrastructure so that in the event that one fiber path is damaged, the network continues running with no disruptions. 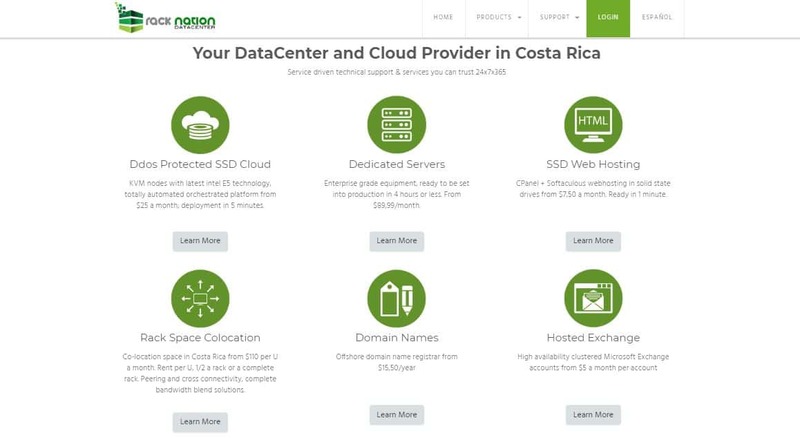 RackNation offers competitive prices compared to other hosting vendors in Costa Rica, and you can sign up on a monthly, quarterly, semi-annual or annual basis. They advertise a 99.982% uptime guarantee, but this doesn’t seem to be backed by any kind of compensation plan. What’s more, RackNation does not offer any refunds for any reason unless a refund promise was made as a promotional offer at the time of purchase. RackNation’s SSL certificates include a trust seal that webmasters can install on their websites to increase visitors’ trust. But these SSL certificates are not free and must be purchased separately. Their plans do include a free anycast DDoS-protected DNS plan with up to 25 zones. The responsive, polite, patient and helpful technical support team are ready to offer assistance 24/7/365. You can reach out to them via their American and Canadian phone lines. Alternatively, you can contact them via email, live chat, and their ticketing system. It’s just a pity they don’t have a more comprehensive set of tutorials for those of you who like to support yourselves. Bottom line on RackNation S.A.
RackNation is an ideal website hosting provider for its solid client base in Costa Rica. Businesses in other parts of the world should consider that this vendor has no data centers outside its own country, which could negatively affect website loading speeds. Wondering how RackNation S.A. stacks up against other Web Hosting companies? Enter any other Web Hosting company and we will give you a side-by-side comparison. Thank you for taking your time to share your thoughts on RackNation S.A.